Last March Make It York launched York’s crowdfunding platform at the city’s historic Bedern Hall. They partnered with us here at Spacehive to make it as easy as possible for as many people as possible to bring their local communities to life through crowdfunding. Ten months later, here are the numbers behind York’s crowdfunding initiative. Better Communities, Growing a Greener Britain, Barclays Life Skills and the Joseph Rowntree Foundation are four of the organisations currently supporting crowdfunding projects in York. Better Communities is a new initiative from social enterprise GLL and supports projects which encourage local people to be active, learn and play together – whether organising a sporty tournament, improving a community library or creating a new sports league. They’re offering pledges of up to £5,000 along with skills from their staff and stuff from their centres to projects that want to do the same. Growing a Greener Britain wants you to come up with great ideas to make your local green space even better! Their fund is available to help you bring your idea to life and make Britain’s parks, gardens, and green spaces that much better. If your project is popular with the crowd and meets their criteria, you could get your hands on a pledge of up to £5,000. Barclays Life Skills is using Spacehive and crowdfunding to get young people running campaigns that develop skills such as marketing a project, writing press releases, creating videos, & pitching to local businesses. If your team includes young people between the ages of 16 and 24, you could earn a pledge of up to £500 to bring your project to life. Joseph Rowntree Foundation wants to support projects that help to realise their vision of a prosperous, poverty-free York. They are particularly keen to support innovative projects working with York’s most disadvantaged neighbourhoods and communities. To apply for a pledge from JRF, get in touch with Helen Robinson, Community Grants Support Officer on 01904 615939 or at helen.robinson@jrf.org.uk. Learn more about the different funds and support available in York here. So far there are 10 projects crowdfunding across York, four of which have already hit their target including a floating arts venue, a local food project, a soapbox race and a 19th century monument. The most recent project to start crowdfunding is “Light Up Acomb this Christmas” which is fundraising to bring festive lights to the town centre. Check out its project page to find out more and to pledge. Grow the movement and add your project here. Crowdfunding brings together citizens, businesses and local government to fuel the change happening in local areas. The York Hive has already seen 488 backers come together to support crowdfunding projects in their local area. With up to £100,000 in funding available alongside support and training through regular events and webinars, the people of York have an amazing opportunity to lead the way in civic transformation. Find out more about what’s happening across the city and get involved here. 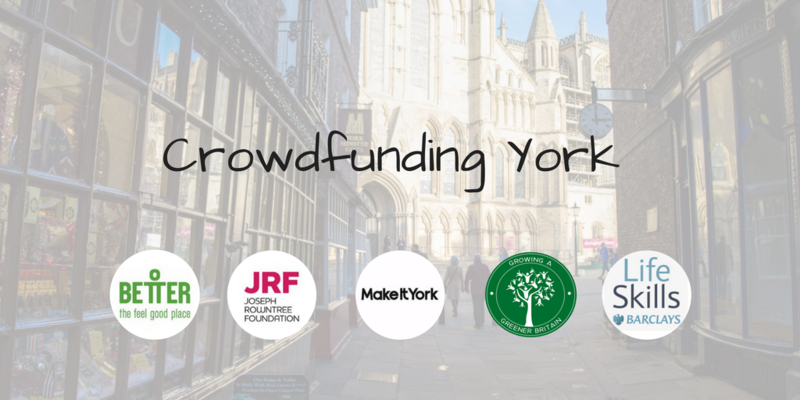 Join Make it York on the 1st of December for a community crowdfunding workshop and learn the skills behind running a successful campaign. Find out more and register here.